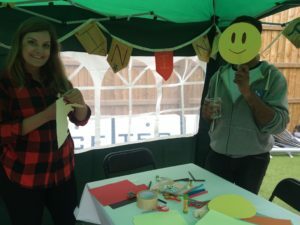 Celebrating 100 years of West London Action for Children! One of our long standing community partners is the West London Action for Children (WLAC). WLAC supports families under stress to develop their confidence and skills to cope with the ordinary and extraordinary challenges of family life by offering counselling and therapy services. This year marks their 100th Anniversary and to celebrate they threw a summer Birthday Party on July 26th. 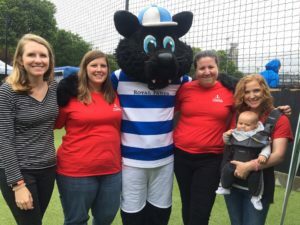 There was a load of fun activities including zorbing, bouncy castle, games for the under-5s, a nailbar, football coaching, cheerleading, food and refreshments, together with QPR stadium tours. 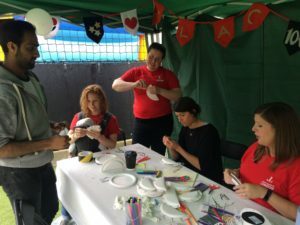 The JLL were there for this fun event and ran an arts and crafts / face painting table for the children. We made emoji face masks and paper plate tambourines. We were thrilled to help celebrate all of the hard work that the WLAC does!